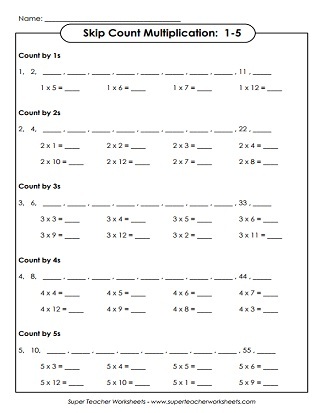 Here you'll find our collection of worksheets on multiplying by 5s. Includes worksheets with all facts from 0-5, as well as worksheets with only 5s, as well as skip counting by 5s. Solve the facts on the page, then color according to the key. The secret picture is a happy blue whale. Ace your multiplication facts with 5s and 6s with these printables. There are several different activities that can be played with these cut-outs. Children will multiply by 5s in order to fill out every bubble on the multiplication caterpillar. Kids can create an origami cootie catcher to review their 5s times tables. Count the fish, flowers, snails, and crayons. Use knowledge of "counting by five" to help. Goes up to 45. Answer the word problems and thinking questions by skip counting. Complete the dot-to-dot. The finished picture is a might elephant. Fill in the missing numbers on the number line. Count 0, 5, 10, 15, 20, 25, and so on. This worksheet has a golf-theme. Skip count by 5s up to 120. Skip count by 5s all the way up to 120. Write answers on the penguins' bodies. Some of the balloons don't have numbers. Follow the pattern and write the missing numbers on the empty balloons. 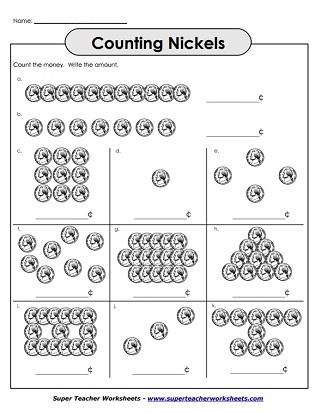 Count the money amount shown by the nickels. Tell how much money is shown by each group of nickels. This drill worksheet has multiplication tables for 0s, 1s, 2s, 3s, 4s, and 5s. 43 problems. Facts through 10, up to 5x10. 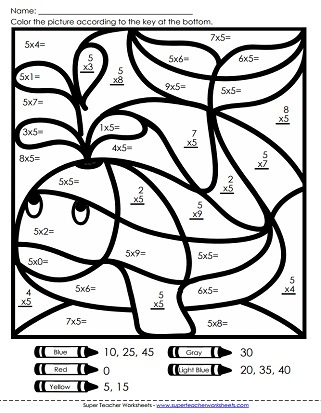 This drill-and-practice page has multiplication tables for 0s, 1s, 2s, 3s, 4s, and 5s. 39 problems total. Facts through 10, up to 5x10, up to 5x12. The key to mastering fluency is to practice answering facts as quickly and accurately as possible. This timed test can help. Facts through 12, up to 5x12. First fill in the skip count number lines, then write the answers to the multiplication facts. Fact families are used to teach relationships between division and multiplication. The printables on this page can be used to help teach the 3s times tables. Multiplying single-digit numbers with 4 as a factor is the topic for this page.